This laboratory consists of three sets of experiments that illustrate the oxidation of glucose for the production of ATP. 1.) 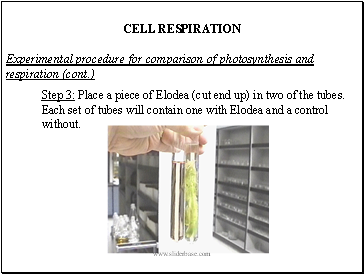 The photosynthesis vs. respiration experiment illustrates the importance of respiration to plants. 2.) Fermentation products will be tested for to demonstrate the importance of yeast in the fermentation process. 3.) 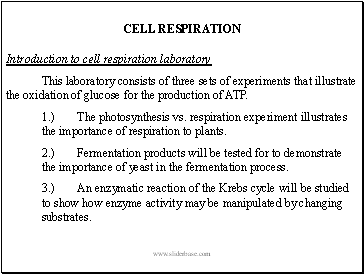 An enzymatic reaction of the Krebs cycle will be studied to show how enzyme activity may be manipulated by changing substrates. It is well known that in the presence of light plants perform photosynthesis. 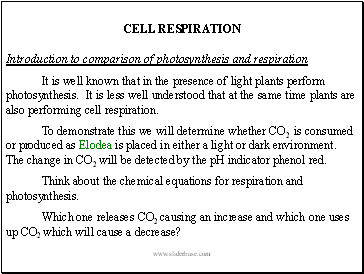 It is less well understood that at the same time plants are also performing cell respiration. To demonstrate this we will determine whether CO2 is consumed or produced as Elodea is placed in either a light or dark environment. The change in CO2 will be detected by the pH indicator phenol red. Think about the chemical equations for respiration and photosynthesis. Which one releases CO2 causing an increase and which one uses up CO2 which will cause a decrease? Phenol red is yellow under acidic conditions (high H ion concentration), pink under basic or alkaline conditions (low H ion concentration) and orange under neutral conditions. A change in CO2 will cause a directly proportional change in H ion. If the CO2 concentration decreases, the H ion concentration will also decrease and the solution will change to pink. 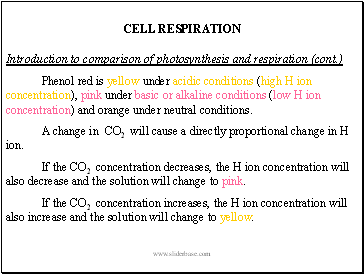 If the CO2 concentration increases, the H ion concentration will also increase and the solution will change to yellow. Step 1: Fill four test tubes approximately 2/3 full with tap water and add 15 drops of phenol red. What tap water should turn pink. Is Glendora tap water acidic or basic? Step 2: Adjust the pH of the tap water to neutral, orange by gently (remember this word gently) blowing into the solution with a straw. Repeat this procedure with all four tubes. 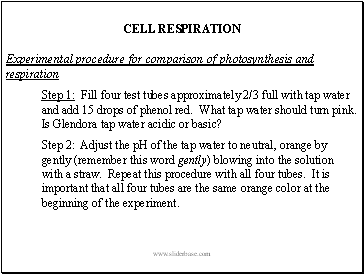 It is important that all four tubes are the same orange color at the beginning of the experiment. Step 3: Place a piece of Elodea (cut end up) in two of the tubes. Each set of tubes will contain one with Elodea and a control without.